Last week I shared that we’ve been doing a lot of clean up since moving to the farm. And that we hate to throw away any of the old barn wood and fencing so we’re using it up in as many DIY projects as we can. Bikeman has already made me a farmhouse console table (that’s coming soon! ), steps to my new She Shed, and tables for his power tools. 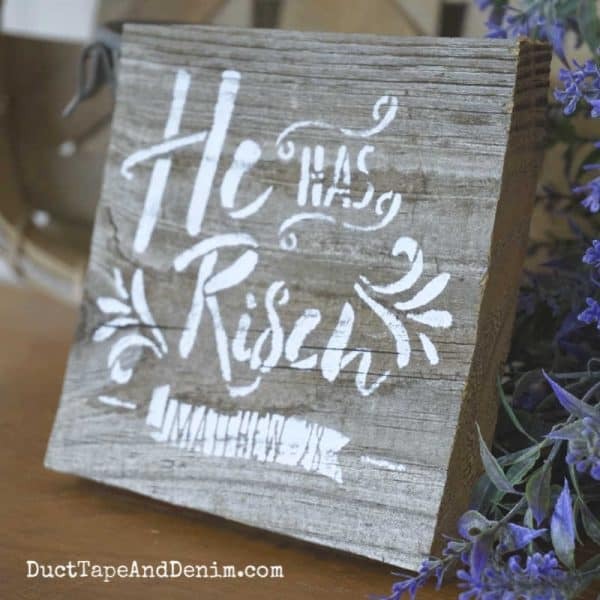 Today I’m sharing one of the easiest projects – a rustic He has Risen sign! (Based on Matthew 28:6.) 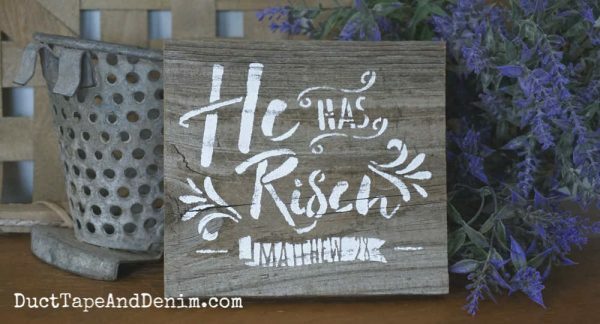 This is a great DIY project for Easter or any other time of the year. Keep reading to see how we made these, or scroll down if you’d rather watch a short video. Bikeman edited my Facebook Live so you don’t have to watch the whole thing! Stencil Revolution sells this stencil in several different sizes. I have the 5″ x 6″ size. So Bikeman cut the old fence boards into 7″ lengths. They were already about 6″ wide. Some weren’t in very good condition so he cut around the back parts. The boards I used were a little wavy but the stencils still worked well on them. I held the stencil in place with washi tape and poured a little white paint on the paper plate. 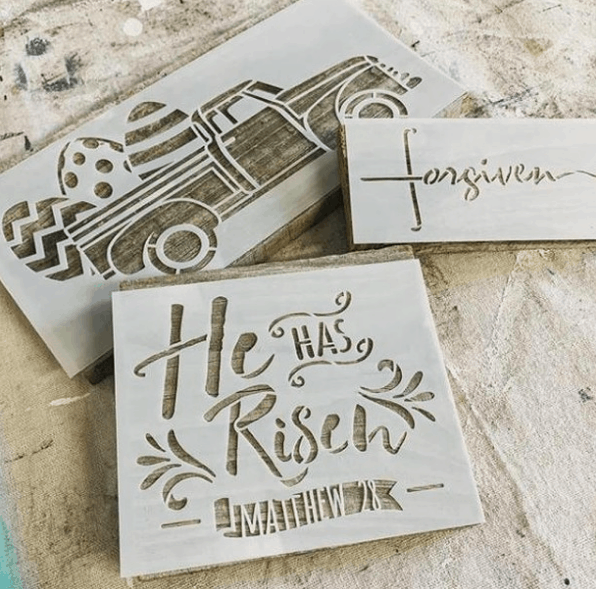 One of the most important things to know about stenciling is not to use too much paint. So after dipping the tip of my stencil brush into the paint I “off-load” it. Too much paint on the brush will cause bleeding under the stencil. Then I started pouncing my brush over the stencil. Don’t use brush strokes. That’s another thing that causes bleeding under the stencil. Several light coats of paint are better than one heavy one. When the paint was dry, Bikeman added a sawtooth hanger on the back with the tiny nails that came with it. He just put one in the center but you could use a couple if your sign is longer. Thanks for reading! 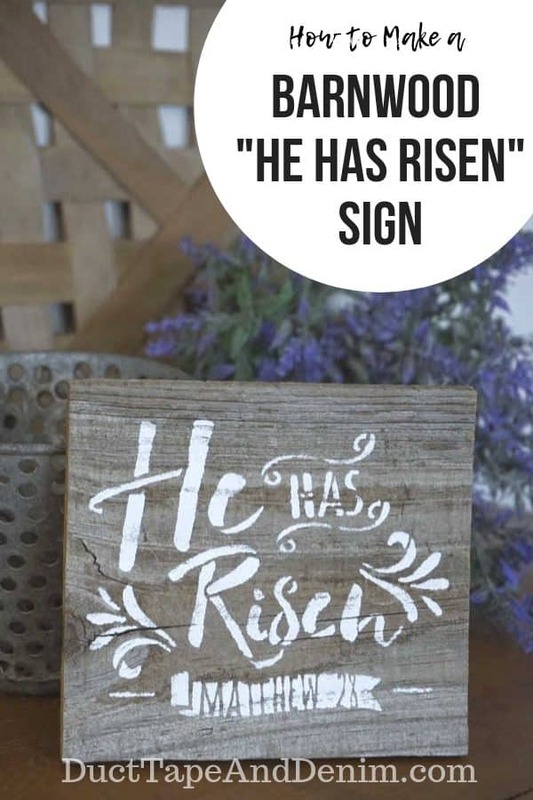 I’d love to hear how you decorate your home for Easter. Leave a comment and let me know. « Welcome to Our Online Vintage Flea Market!